Going back to work and having both kids in school/daycare has been an adjustment for us all. I was beginning to feel like I hardly saw Lucy at all anymore. She'd come home from daycare and sleep what seemed like all evening. Then she'd wake up and have her bottle and go straight to bed for the night. She wouldn't even wake up herself in the morning, Mike would have to wake her up to get everyone to work/school/daycare. I was beginning to long for even a 2:00am feeding just to see her! Thankfully yesterday was a different story. She was awake and ready to play when we got home. She only took a short half hour nap (just enough time for Benjamin and I to make and eat dinner) and then was up until 9:00pm playing and just being awesome. I needed that. 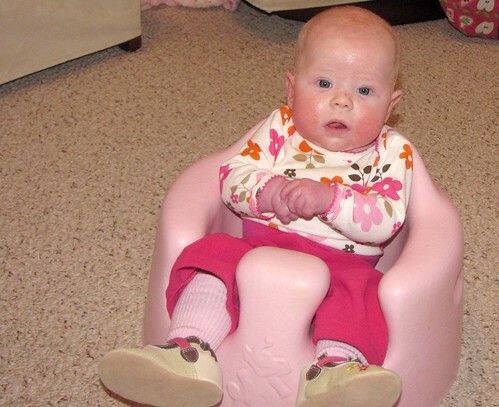 She's doing so well keeping her head up that she's now able to use her Bumbo seat. These are a new thing for us because they didn't exist when Benjamin was a baby. So much fun! 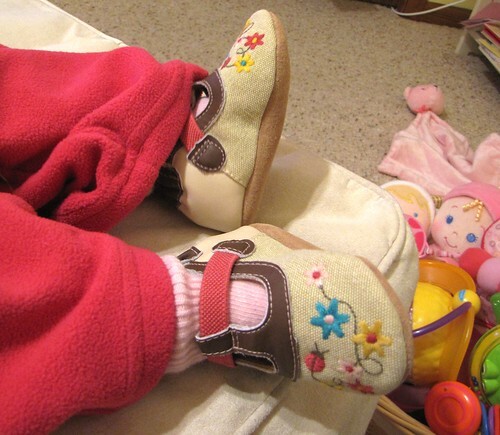 She even can mostly wear her very adorable Robeez shoes that I bought her before she was born. They're still a bit big, but she doesn't mind.